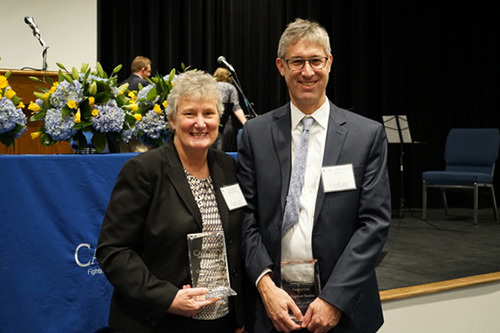 Two individuals critical to the Winship Cancer Institute of Emory University programs at Emory Johns Creek Hospital and Emory Saint Joseph's Hospital were honored by the CanCare organization at its fifth anniversary celebration on February 25th. Stephen Szabo, MD director of Winship's community oncology program at Emory Saint Joseph's Hospital and Connie Masters, RN, MSN, specialty director of oncology for Winship Cancer Institute at Buford, Emory Johns Creek Hospital and Emory Saint Joseph's Hospital, were recognized by CanCare for their long-time efforts to integrate the program throughout Emory Healthcare. "It is an honor to work with such an incredible organization that helps patients and caregivers on their cancer journey," says Szabo. "The CanCare network has made a tremendous impact on our patients with volunteer cancer survivors who provide emotional support and encouragement while also helping families navigate the challenges they are facing." The nonprofit organization partners with Emory Johns Creek Hospital and Emory Saint Joseph's Hospital to train cancer survivors who volunteer to provide free and confidential support and resources to cancer patients. "Cancer patients usually don’t discuss their feelings with family members, but this changes once they meet the CanCare volunteers," says Masters. "The patients feel comfortable sharing their feelings with the survivors, and this leads to more open discussions between patients and their family members." CanCare matches volunteers with patients at Winship based on their treatments, age, gender and location. The group allows volunteers to mentor patients during their treatment and provide encouragement to patients and their families. Neal Kuhlhorst, M.Div., LMFT, development coordinator for CanCare in Georgia says the "Victory of Hope" celebration was the perfect opportunity to thank Szabo and Masters for their contributions to CanCare over the years. "Dr. Szabo and Connie Masters have been champions of CanCare in Atlanta since day one," says Kuhlhorst. "They helped bring CanCare services to Emory and have both been involved in our continuing education programs and our volunteer training." Szabo and Masters were recognized at CanCare's "Victory of Hope" celebration on Saturday, February 25 at Johns Creek Presbyterian Church.